Your Business Has $1M in Coverage and a $100K Loss. How Can You Be Underinsured? Coinsurance. Let’s say your business has a commercial insurance policy with $1 million in coverage, and one of the buildings covered by your policy suffers damage that will cost $100K to repair. You should be all set, right? Not always. Coinsurance is a clause in commercial policies that allows the insured to save money on the premium, which is of course very appealing to any business owner. But such savings can affect the payout of a claim, depending on the percentage of coinsurance selected. This is an issue that can arise depending on the decision you make regarding the coinsurance percentage. If you elect to insure your property for 100% of its value, the limit of insurance you are paying for must equal 100% of the replacement cost of that building. Thus, if your commercial property would cost $2M to replace, you should carry a limit of insurance totaling $2M. If you only carry $1M in coverage, then you are only insuring for 50% of the property’s value and therefore not meeting your 100% requirement. This exposes you to out-of-pocket costs in the event of a loss. If you had that $100K loss highlighted above, for example, the insurer would only pay you for 50% of the loss – leaving you responsible for the other $50K. You don’t have to choose 100% coinsurance – you can choose 80% or 90%. Why opt for 80? Let’s look at the following real-world example to get a sense of how coinsurance works. 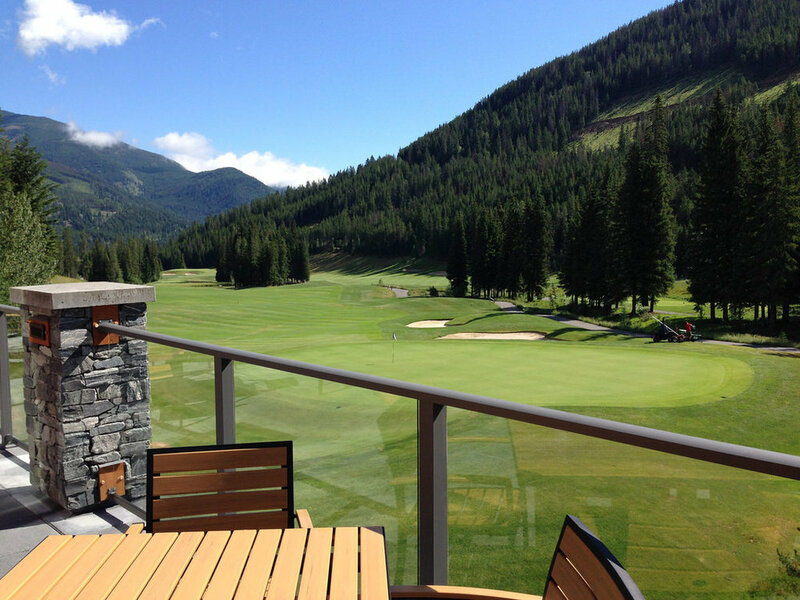 A golf club’s main clubhouse, which is valued at $250,000 (the “Property Value” or cost to rebuild with “like kind and quality”), experiences a fire in the kitchen that causes $40,000 in damage (the “Amount of Loss”). The golf club had elected a coinsurance rate (the “Coinsurance %”) of 80 percent, a limit of $100,000 (the “Limit of Insurance”), and a deductible of $500 (the “Deductible”). After the fire, it was determined that the cost to rebuild the clubhouse was $250,000. Is this property adequately insured? We can find the answer in 4 easy steps. Determine how much insurance you should have carried to meet the coinsurance requirements. To make this determination, multiply the Property Value ($250,000) by the coinsurance requirement (80%). Thus: $250,000 X 80% = $200,000. Uh oh – looks like you’re underinsured. Let’s keep crunching the numbers to see by how much. To calculate the coinsurance penalty, divide the Limit of Insurance ($100,000) by the amount of insurance you should have carried ($200,000 – as calculated in Step 1). Thus: $100,000 ÷ $200,000 = 0.50. Multiply the Amount of Loss ($40,000) by the coinsurance penalty (0.50, as calculated in Step 2). Thus: $40,000 X 0.50 = $20,000. 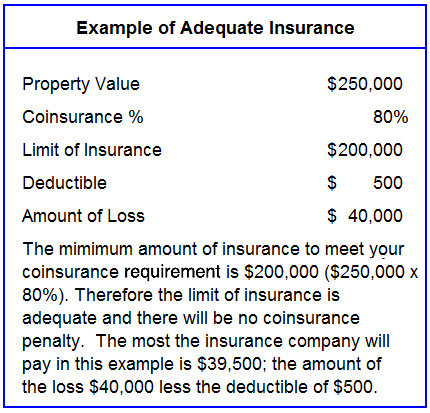 Now subtract the deductible ($500) from the amount of the loss payable ($20,000, as calculated in Step 3). Thus: $20,000 - $500 = $19,500. This amount is what the insurance company will pay you. The remaining $20,500 is not covered and will come out of your pocket. Want to see an example of adequate insurance? Take the same scenario above, only increase the Limit of Insurance from $100,000 to $200,000. Use the same numbers otherwise (Property Value, Coinsurance %, Deductible, and Amount of Loss). A well-appointed private golf club has 10 buildings on its course grounds, insured by a commercial package policy that includes $2.5 million in “blanket coverage” for the structures. This means that the cost to rebuild all 10 structures listed on the policy in the event of a catastrophic loss would total approximately $2.5 million when added together. The main clubhouse has a limit of liability of $1M. The clubhouse experiences a total loss that amounts to $1M. However, the insurance company realizes that the remaining 9 buildings that are listed on the policy do not have enough coverage on them to meet the $2.5M coverage limit. If it is determined that the total amount to rebuild all buildings is $3M, the insured will only receive 83% of the insurance settlement. ($2.5M/$3M=83%). Therefore, if you use blanket coverage for your buildings, you need to be certain that the total amount of coverage is adequate. Coinsurance is a complicated topic, so hopefully this helps you grasp its complexity. Be sure to have your agent walk you through all related aspects of coinsurance – and be sure you have enough coverage based on an accurate property value! Otherwise you run the risk of paying more out-of-pocket should you experience a loss.